Picked this axe head up for 15$ (CAN). It was rusted pretty bad and was hard to see what was hiding underneath. It has been fun restoring it so far, I seem to be getting better and better at it and it is quite relaxing for me. I have not yet put an edge or haft on it. In the meantime, I was hoping you could help me identify it's maker or even suggest what size haft it should be put on to be as close to original as possible. It has only one marking on it : M4 (probably means that M4 Tool steel was used to make it?! 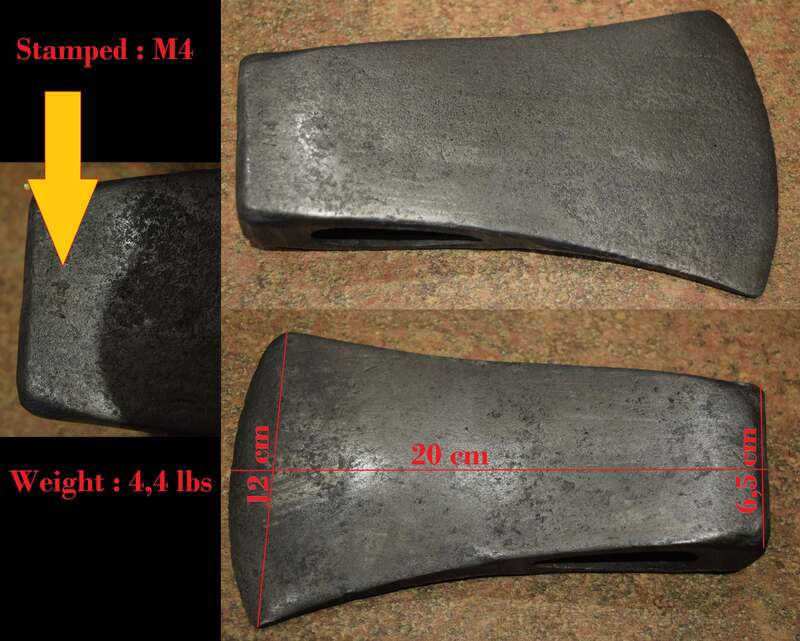 Good steel for an axe head?!). Thanks! Have a happy new year. I can't help you identify this axe head, But I did dig up a similar one on our creek flats many years ago. I fitted a straight helve on it, & it is great to use. i thought i saw some confusion over similar a few years back. this reminds me of when mann brought collins. iirc some m marked axes came into circulation. to my knowledge no definative answer has ever been accepted.